Part 50 of Wonders of World Engineering was published on Tuesday 8th February 1938, price 7d. 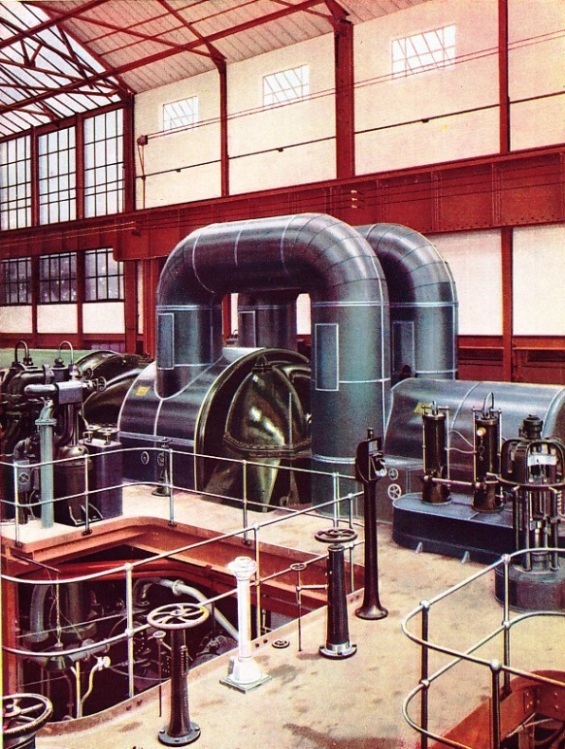 Part 50 includes a colour plate showing the steam turbine in the power house of the Hackney Electricity Works. It formed part of the article on Steam Turbine Construction. The colour plate previously appeared as the cover to Part 21. 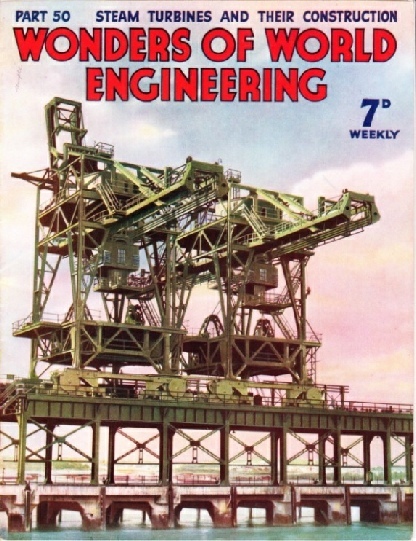 The cover of this week’s Part shows the gigantic electrically driven plant used at Dagenham, on the River Thames, for unloading iron ore, coal, limestone and similar material for use in the Ford Works. The plant, the only one of its kind in Europe, is built on a jetty close to the works. Steamships coming alongside the jetty unload their cargo at the rate of about 300 tons an hour into wagons on an elevated railway. Electric locomotives haul the carloads of material to the adjacent storeyard, where as much as 30,000 tons of material can be accommodated. The war of 1914-18 was indirectly responsible for the development of the small, economical car. Although progress was retarded during the war period, the motor industry made rapid strides in the immediate post-war years. Several makes of car famous to-day were introduced during that period. In an informative chapter, L H Thomas describes the production of armoured cars during the war, and the development of the ever-increasingly popular light car. 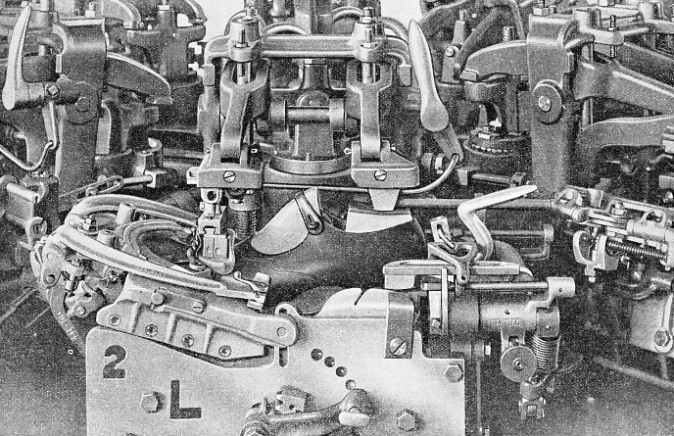 This is the fifth article in the series on the Story of the Motor Car, and covers the period between 1914 and 1922. ONE OF THE WORLD’S LARGEST CHINA CLAY PITS is situated at Lee Moor, South Devon. Water is sued to break down the clay and carry it to the bottom of the pit, where the pure kaolin is extracted by a separator process. 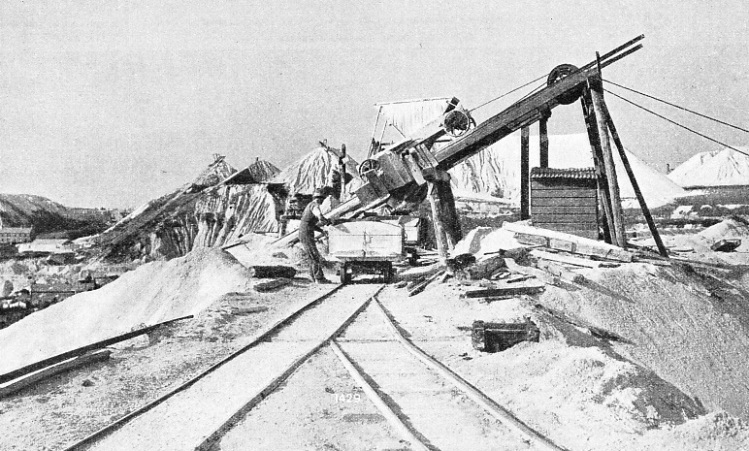 The kaolin is carried on with the water, and the sand, or waste material, is hauled to the waste dumps on the surface on inclined cable tramways. An account of the fine system of waterways which run inland from Goteborg to Stockholm. Many of the canals were of early origin and for their time were remarkable examples of civil engineering. This chapter is by C Hamilton Ellis and the article is concluded from part 49. CEMENT SOLE ATTACHING MACHINE used to attach uppers to the cemented sole. The soles are first placed in the machine and fixed in position. The shoe is then automatically centred and pressures up to 300 lb per square inch are applied. 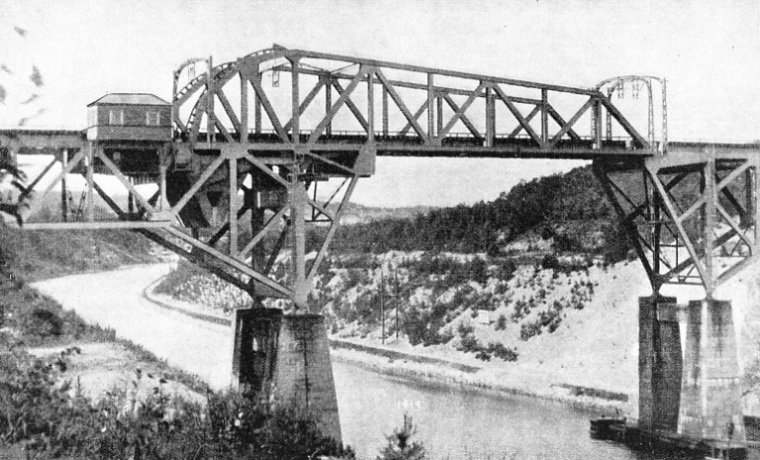 A SINGLE-BASCULE BRIDGE carries an electric main-line railway across the Sodertalje Canal, near Stockholm. The canal links the southern end of Lake Malar with the Baltic Sea. Rebuilt in 1924, the canal accommodates vessels drawing 20 feet of water. IN THE POWER HOUSE the steam turbine generates electricity which is used in millions of homes, workshops and offices for lighting and heating. The 30,000 kilowatts turbine in the Metropolitan Borough of Hackney (London) Electricity Works was installed in 1932. Working at a speed of 3,000 revolutions a minute, this turbine develops as much as 40,000 horse-power. This colour plate also appears on the cover of Part 21. Devonshire and Cornwall have for centuries been among the world’s richest sources of china clay. 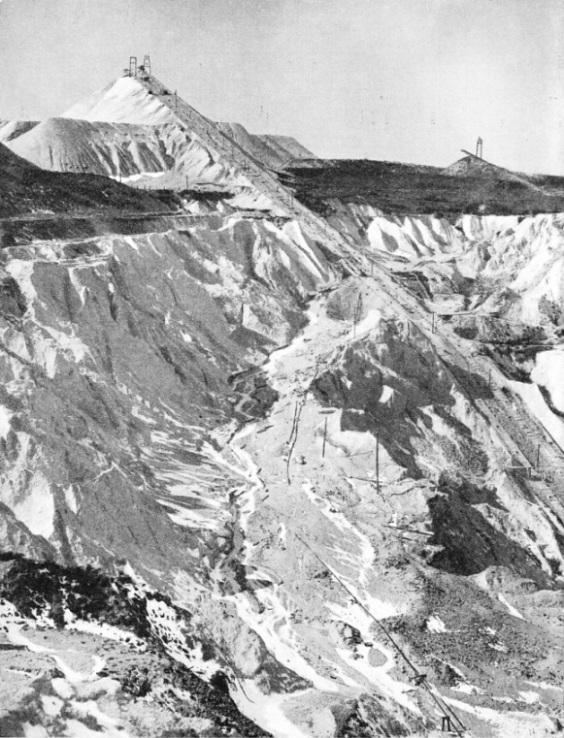 Methods of mining vary with the natural state of the deposits, and modern practice closely follows the methods used in former days. The way to make china or porcelain was not known in Europe until the eighteenth century, when specimens of china clay were obtained from China. The technical name for china clay, an essential ingredient in the manufacture of porcelain, is “kaolin”, a corruption of the Chinese “Kaoling”, the name of the district in which the clay was first found. In this chapter, C Hamilton Ellis describes the mining of china clay in Devonshire and Cornwall. You can read about the Manufacture of Pottery in part 46. THE SKY-TIP is the name given to this arrangement of the headstock of the inclined cableway, as used extensively in Cornish mines. The end of the railed inclines is built up of sliding beams and guys. The sand wagon consists of a hopper skip with automatic discharge doors at the bottom. There are two main types of steam turbine - impulse and reaction. The principles are different, but the processes of construction are somewhat similar. In either type steam is caused to impinge on blades carried on a rotating part. The high speeds and stresses involved necessitate great strength and accuracy of manufacture. As well as being an informative account of how turbines are built, this chapter explains the main principles of turbine design - impulse and reaction. This chapter is contributed by Edwin Judd. You can read more on Sir Charles Parsons in part 47, and more on steam turbine engines in Shipping Wonders of the World. 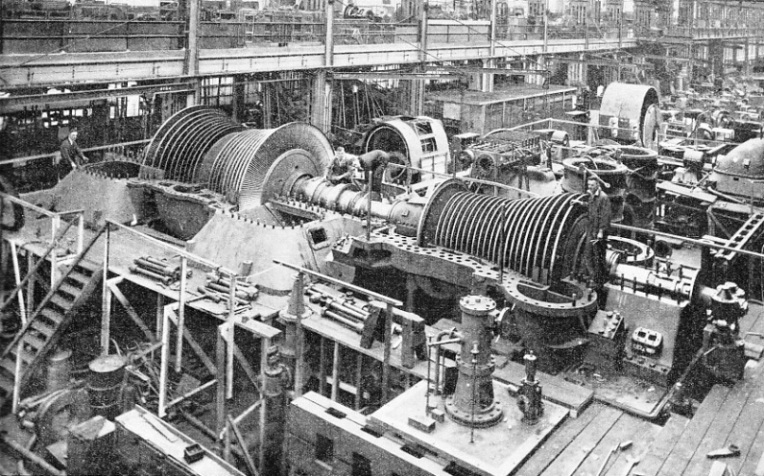 IN THE MAKER’S WORKS, a huge steam turbine in course of construction. The casing, which encloses the rotor and blades, is made in halves. In this photograph the top casing has been removed. The turbine generates 50,000 kilowatts at 1,500 revolutions a minute, being of the two-stage double-flow type. Ingenious machines, working at remarkable speeds, are used in the large-scale production of modern footwear. Although the craftsman has been outpaced, the quality of machine-made shoes nowadays closely approaches that of shoes made by hand. Before the Industrial Revolution shoes were all cut and sewn by hand. Mechanical methods were first used during the Napoleonic Wars to make the boots for the men of Wellington’s armies. The manufacture of boots and shoes is now so highly specialized that a different machine is used and a different operator employed for each part of the process. In this chapter, Edwin Judd describes the making of shoes, from the raw hides to the finished article. This is the fourth article in the series Industrial Machinery at Work. In few regions are natural conditions so favourable for the production of hydro-electric power as in the Serra do Mar, Sao Paulo, Brazil. Here great reservoirs have been formed on a plateau at the top of the range, a short pipe line feeding the turbines in the plain below. Hydro-electric engineering is one of the most fascinating and important branches of the engineering profession. Each plant must be individually planned according to the nature of the country, its rivers and rainfall. 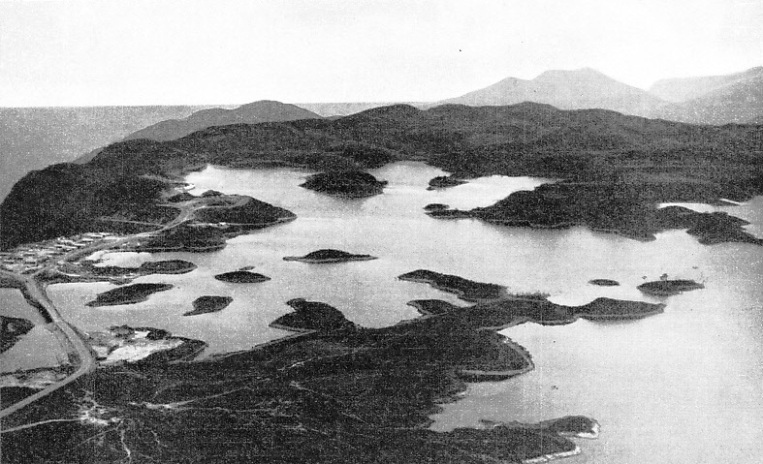 Extensive reservoirs and hydroelectric works have been built in Brazil. The size of Brazil is not generally realized. To many people Brazil means the tropical jungles of the Amazon, with coffee and sugar plantations in the clearings. Brazil, however, is a vast country twenty-seven times the size of the British Isles, with climates varying from tropical in the jungles and the plains to temperate on the great plateaux. In certain regions climatic conditions favour the development of large cities with their industries, and natural conditions facilitate enormously the hydro-electric installations which serve and stimulate their development. The population of Rio de Janeiro is 1,600,000, that of Sao Paulo City, over 1,000,000. The range known as the Serra do Mar, in the State of Sao Paulo, rises gradually to a height of more than 2,000 feet and then drops almost perpendicularly a few miles from the coast near the port of Santos. How this natural feature has been used to obtain power from the waters of the range is told by Rolt Hammond in this chapter. The article is concluded in part 51, and it is the eighth article in the series Wonders of Water Power. 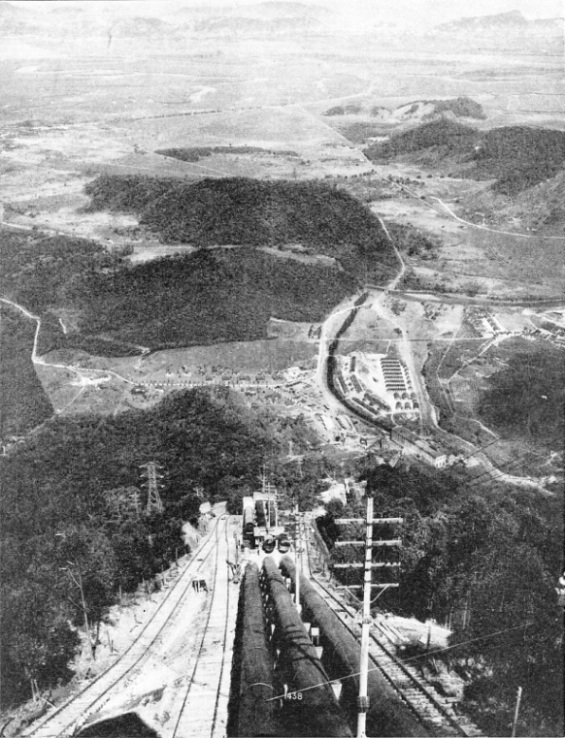 ON THE EDGE OF THE PLATEAU above Serra Do Cubatao, a concrete dam, 85 feet high, was built across the Rio das Pedras to from a storage lake at the top of the pipe line leading to the power house. This reservoir forms a forebay for the great chain of reservoirs on the Serra do Mar, a range which rises abruptly to a height of more than 2,600 feet above the sea. ROLLS-ROYCE “SILVER GHOST”, the 40-50 horse-power car which preceded the famous “Phantom” series. From this illustration, which shows a 1920 touring model in Australia, it will be seen that the general appearance of the car was surprisingly similar to that of many cars of much later date. This model, however, had cantilever rear springs and no front-wheel brakes. LAYING THE PIPELINE to the power house at Serra do Cubatao. In all, four lines have been laid and anchored to the steep hilliside by blocks of concrete weighing from 1,000 to 3,200 tons. The length of the pipeline slope is 5,100 feet and its average incline 50 degrees.